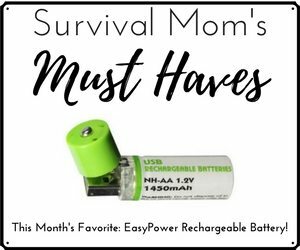 Earlier this year I was intrigued when asked the question, “Which is the best mini survival kit?” I had never purchased a store-bought kit, so I ventured over to Amazon and ordered several, just out of curiosity. Here is my review of those kits and, at the end, the #1 mini survival kit that is, by far, the best of all those tested. If you’re interested in any of the first 4 kits, they are available on Amazon. This kit contains 9 items, plus a sturdy plastic case. You can see the contents above. 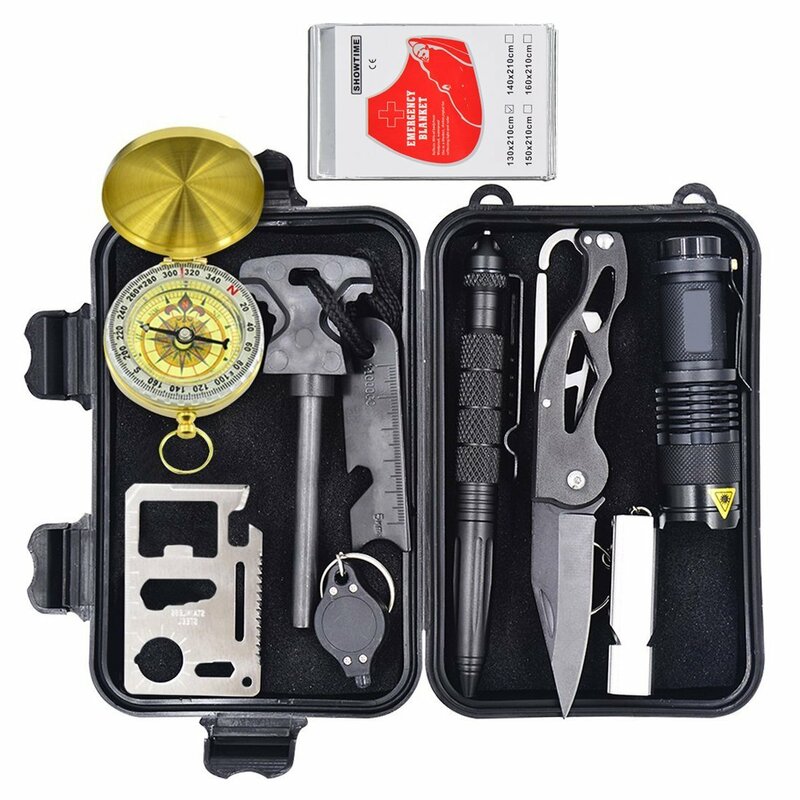 They include a tactical pen, compass, flashlight, a flintstone and scraper, a very small keychain mini-light, multi-function knife, a Swiss Card, and a whistle. I consider this to be just a collection of EDC gear. My son was excited to see the tactical pen, but within 5 minutes, the pen broke. 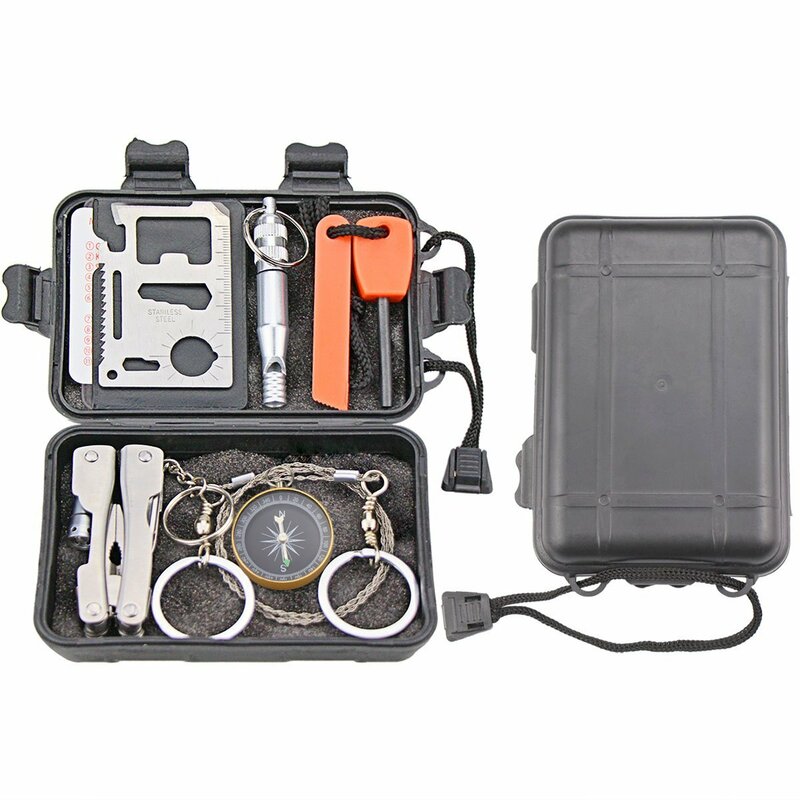 Assessing the tools included in this kit, you could probably start a fire, open a bottle of beer or soda, head North using the compass, blow the whistle if need be, and use the blade/multi-tool for miscellaneous tasks. As far as a “mini survival kit” goes, this one is pretty standard. I wouldn’t want to bet my survival on these 9 items and at $21.99, current price, it’s not a bargain. Because of the knife and Swiss Card, this wouldn’t be an appropriate gift for anyone under the age of 12 or 13. NOTE: The photo shows something that might be an emergency blanket, but I did not receive that in the kit I ordered from Amazon. Don’t be fooled by the 5-star ratings. Those appear to be written by paid reviewers. Hey! What do you know! This kit is identical to the Teaker kit but you save a whole penny if you buy the Eachway! No kidding. I was disappointed to see virtually no difference between the Teaker and the Eachway. The flashlights are identical, except the “UltraFire” branding on the Eachway light. Every tool is identical, and my assessment is the same as for the Teaker. For $21.98, you can do better at Walmart. I suppose if you were on your last leg and had nothing else for survival, maybe you could survive for a few more hours if you had this kit. But I wouldn’t bet on it. The emergency blanket, made in China, is like every other emergency blanket. It has some uses, for sure, but most survival experts agree that the typical thin, mylar blanket will do very little in a survival situation. I was disappointed by the keychain compass — I’m pretty sure I’ve seen similar compasses in Oriental Trading Company catalogs, and the one I got looks nothing like the one in the photo. The whistle, fire starter, and wire saw are also of poor quality. There isn’t anything in this kit that is well-made, except maybe the Swiss Card, and those are probably mass produced for a penny each. This kit is priced at just under $15 on Amazon. Save your money. I bought this kit because it looked pretty cool. I knew when I was finished with the review, my son would want it. For the review to be fair, though, I decided to unwrap the paracord to check out the tools inside, and now we’re left with a pile of paracord, foil, and a bunch of little tiny things. 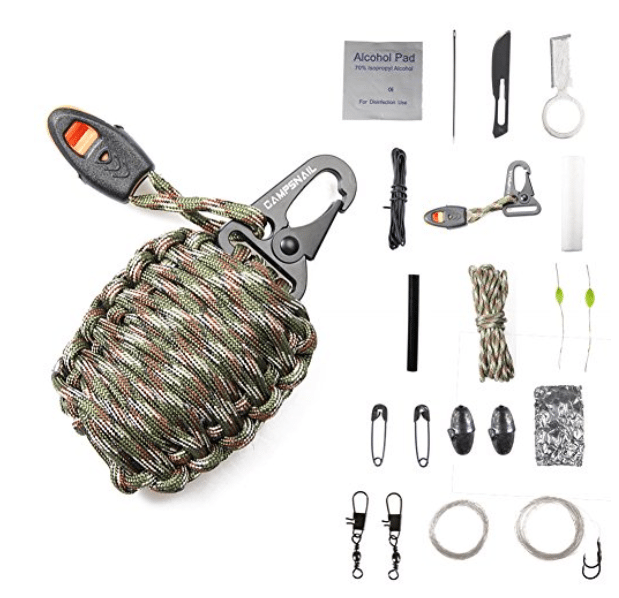 The 26 feet of paracord is very good quality, as is the small caribiner. You can easily connect this grenade to a backpack or another larger piece of gear. It takes a few minutes to unwrap the grenade to reach the aluminum foil-wrapped contents. 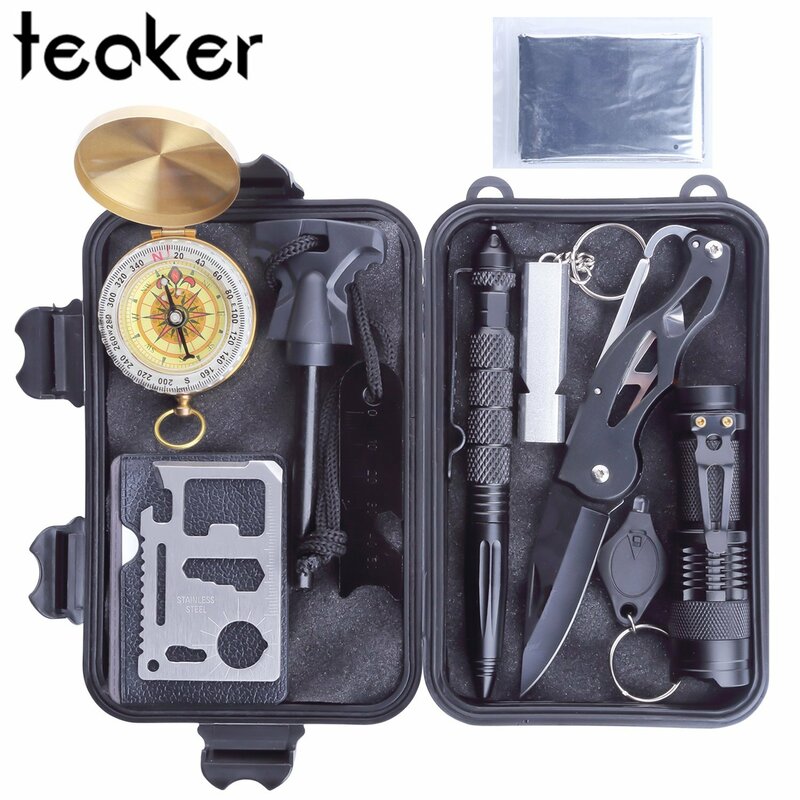 This kit might be useful for someone who already has some pretty good survival skills, because the contents can be useful, you just have to know what to do with them. Examples: the fishing hooks, line, and weights. You could use the paracord strands and some know-how to set a snare, but again, that relies on prior knowledge and training. Bottom line: the best feature of this kit is its unique packaging. The gear inside the paracord grenade would be of little use to most people, and the pieces small enough to make this a gift only appropriate for kids ages 12 and up. At $10.99, it’s not a bad end-of-the-line survival kit. The concept behind this kit is different from the other minis. Its focus is less on giving you little gadgets that may or may not help you survive and more on covering the most important survival bases: shelter, warmth, light/signal, a whistle, and a small spork with multi-tool capabilities. The Tact kit is quite a bit larger than the other kits reviewed here and comes in a drawstring bag, rather than a hard plastic case. In the world of survival kits, it still qualifies as “mini”. I prefer the bag over the plastic case because it can be useful in dozens of other ways in a survival scenario. Of everything included, the Bivvy is the largest piece. It’s a lightweight waterproof and windproof emergency sleeping bag made of space-age material that reflects your body heat and keeps you warm. Similar bags sell for close to $20 in sporting goods stores. Next to the Bivvy, I was impressed with the stainless steel, 16-ounce camp cup. I like the way it looks and feels (very solid), but with its larger size, it can be used as a drinking cup or, over a fire, used to make a small cup of soup or oatmeal. It really is a handy size and is what I based my own Winter Survival Food Kit on. You can read details of that here. The heavy-duty spork is more than just an eating utensil. It’s also a multi-tool, with a bottle opener, 3 sizes hex wrench, and a flathead screwdriver. With the sleeping bag for warmth and shelter from the elements and a quality cup/cooking pot, the Tact Mini Survival Kit adds a smokeless pocket stove, a few fuel tablets, and waterproof matches in a case. Now you’re ready to purify water, melt snow, cook, or just keep warm. 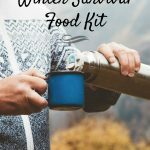 With a few packets of dried soup mix, oatmeal, or packs of coffee, you would have the makings of a Winter Survival Food Kit, as detailed in this article. The stove could also be used as an emergency signal if you weren’t able to start a small fire using materials around you. With the flashlight and whistle, you’re ready to signal for help, and the small flashlight is another source of light. 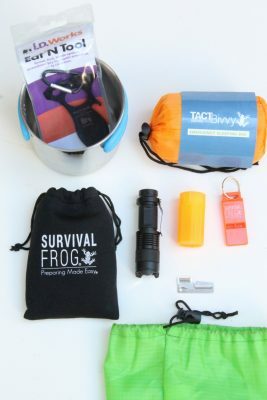 The Tact Mini Survival Kit is more expensive, as you might expect — $49.97 — click on this Survival Frog page. Pick up more than one and Survival Frog throws in some bonuses and free shipping. 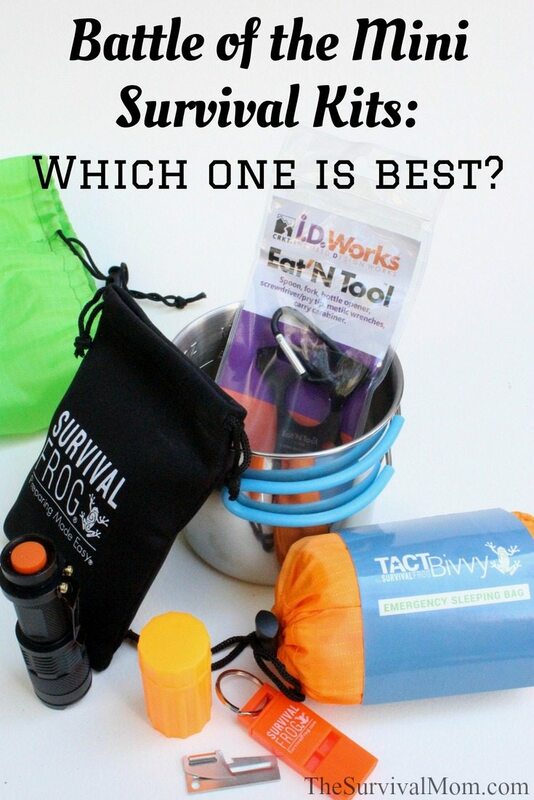 If you don’t have time to thoughtfully and carefully put your own mini survival kit together, then the Tact Mini Survival Kit is the way to go. There’s enough room in the drawstring bag for your pocketknife and a few other EDC items, so you can get the best of both worlds — a high-quality kit that is ready to go and then customized with your own favorite gear before you pack up and head out. So, there you have it. 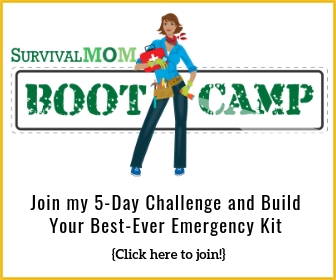 Five reviews of mini survival kits. When I first set out to do this, my curiosity level was high and I was optimistic. As the kits began arriving and I had time to check them out, overall it was disappointing. The potential is there for a company to produce a well-thought-out kit, truly designed to help people survive in an emergency, and with very high-quality gear. 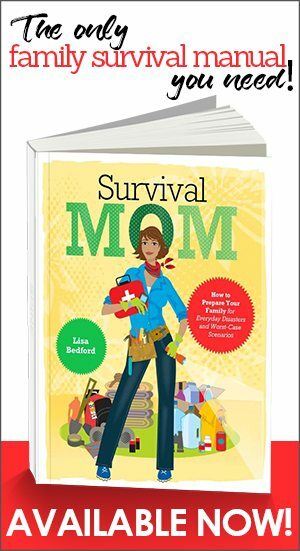 Only the Tact Mini Survival Kit delivered and is one reason I’ve selected Survival Frog as a Survival Mom affiliate. If you buy the Tact for yourself or as a gift, let me know what you think. I love you Mom, and the Frog! Two of my favorite sites, I highly recommend them both. 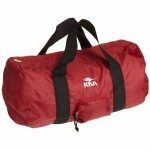 Every car or backpack needs a Tact bivy. Sounds like it’s time to create the Bedford Mini-Survival Kit! Thank you for this thoughtful review. Your points were spot on. I was at Walmart yesterday and their outdoor section has many of the things available in the mini kit for decent prices- the spork/tool, metal cup (not sure about the quality), and a stove with fuel pellets ($5), to name a few. They don’t have bivies, but they do have emergency blankets and ponchos. 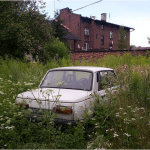 If you wanted to make your own kits, you could do so quite cheaply. It’s taken me a while to get back with you because there were MANY glitchy things going on with the site, all of a sudden. I do use an ad network so I don’t need to be in the business of negotiating rates and collections. That is no fun. I moved to a new email system and yes, for a while there were 4 or 5 popups happening, and we had to chase them all down and disable the plugins that were running them. It has been quite messy on the backend, but the good news is that due to a very deep cleaning, the site is running smoothly, quickly, and soon will be transferred over to a https site, which is more secure for everyone involved. Best of luck to you and your site. Thank you for your site. You make preparing make sense. Trying to figure it all out while working, taking care of my family and getting time to enjoy life can be daunting. I have passed along many of your tips to my friends and family. 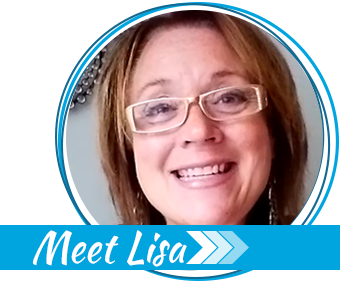 We talk about your website almost every time we talk. Anyway, I was looking for a small kit for my desk at work and thought maybe a mini kit was just too small. So while I was on Amazon I found this kit https://www.amazon.com/Earthquake-Emergency-Commuter-Auto-School/dp/B005DHCWQA/ref=sr_1_17?ie=UTF8&qid=1525624867&sr=8-17&keywords=earthquake+kit which seemed like a good value. It has enough supplies to get me through a couple of days if I ever god forbid have to stay at work. That last one would make a nice gift for the woefully unprepared in our lives. May even spark some interest.